The man, the myth, the father of needlessly obscure German philosophers. So one day when I was really bored in my modern philosophy class, a not infrequent occurrence, I wrote a poem using only Kantian terminology which I found, and still find, ridiculous. I presented it as a token of my appreciation to my TA at the time. She said I used all the terms properly, which I took as a victory. I present it to you now because it’s my blog and why not? Depending on the response, more ridiculous poetry might follow. I have a classic one about neutering a dog and another about ties. My college years were fecund with creative rapture. Also, I had an intro to poetry writing class. Hahaha, I can very much relate. I just did a project emulating Dorothy Wordsworth. Nice. Yeah, this was years ago, but I consider it one of my best poetic achievements. I realized that in my intro to poetry writing class, I can only write free verse. Of course, I feel like that’s not really writing anything, at least when I do it. Well, thanks for stopping in. Great Post. 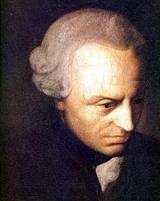 I took a class on Kant in college, and it was the most difficult philosophy class EVER. I still have trouble understanding him! But of course he was brilliant and an amazing philosopher. Good emulation!